We get used to see refuse bins as simple and often muddy containers which don’t impress us by anything. Two students of London Economy School decided to change people attitude to the refuse containers. Now it is an innovation item which was created with new technologies. Henceforth the refuse bins are not only collecting waste but the information blocks also created by Renew company. On the threshold of London Olympic Games near 100 containers appeared in the financial London centre – the City. This construction was made by the Renew. The container is a tank of middle sizes with very durable walls. Such construction makes it possible to secure people against probable explosives (after acts of terror in 2005 in London centre it is forbidden to put usual bins). The container walls have liquid-crystal displays showing different information from advertising and notices to information about quotes and situation on stock exchanges which is very actual for the London’s City residents. All Renew containers network are fitted up by the system to exchange messages instantly if some emergency situation will be. But nevertheless the main function of the containers is advertising. The Renew specialist declared that more than about 3 million people saw displays’ advertising every day during the Olympic Games. Besides the containers components are environmentally sound. The Renew company wants to donate some profits money to energy-efficient projects development in other territories all over the world. The cost of one container is £ 25 000. The company installs these “smart” containers after the Olympic Games also and also it made a contract with the City for 21 years in future. Today the Renew has agreements with other cities. 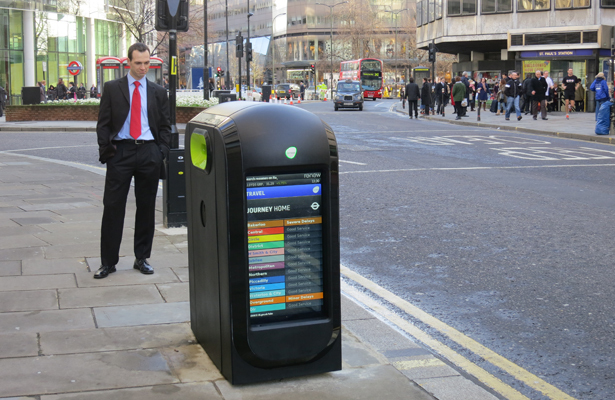 It will install refuse bins in Manhattan and Singapore. In Japan these intellectual containers will also support security during earthquakes.